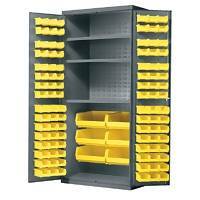 Making the most of your Storage Space! Buy 2 or more units and take 20% off!! Model 367 Threaded Rod Rack. Separates and protects threaded rods. 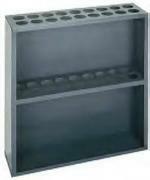 Eighteen 2 1/16" diameter openings accommodate different sizes. Shipped fully assembled. 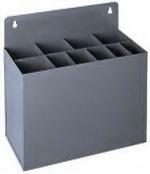 Durham's heavy duty Wire Spool Rack include one with four plated 5/8" diameter steel rods for the convenient storing and dispensing of wire. 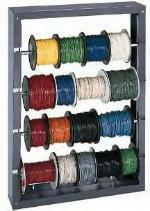 The four rod rack (Model 368) holds spools up to 10" in diameter. approximately 12" long. Keyholes permit wall mounting.